Cavers explore natural caves in the rock and some old mines that were once used to obtain lead, copper and other metal ores, slate, stone, or other useful minerals. We don't go down old coal mines due to the risk and legal issues. Caves form over thousands of years and are almost entirely formed by natural processes. Mines are man made and are dug by hand, or with the aid of explosives. Many have been abandoned for hundreds, sometimes thousands of years. Most of the caves we explore form in limestone. This rock dissolves in slightly acidic rain water. Over many thousands of years vast systems of passages can form with deep vertical pots and huge chambers. Some of the dissolved limestone can be redeposited inside cave passages forming beautiful white calcite stalactites and other formations. So what is the difference between a cave and a pothole? Very little. Pothole is a word used mostly in Northern England for a cave that is vertical in character. So if you see a name like Nettle Pot, it is likely to involve negotiating vertical sections to descend. That isn't a hard and fast rule. Newby Moss Cave is in Yorkshire, is 110m deep and almost entirely vertical. Potholing is just another name for caving, as is Spelunking if you are an American. In the UK, the biggest cave system currently known is the Lancaster-Easegill system, underneath the moors at the junction of Lancashire, Yorkshire and Cumbria. This is often referred to as the Three Counties System as a result. 89km of passages have been surveyed here. In South Wales, Ogof Draenen is 70km long. The deepest cave system in the UK is Ogof Ffynnon Ddu in South Wales with a vertical range of 308m. The second deepest is the Three Counties system at 253m. For more details see Longest and Deepest. The longest and deepest cave could change at any time as new discoveries are made. Everyone knows where the large mountains are. The biggest and deepest caves are hidden till people find and explore them. Most of the caves and mines we go down have been previously explored by cavers. Their locations are known and surveys (maps) and descriptions are available so we have a good idea of what to expect, what equipment and ropes we will need and what difficulties we may encounter. An appropriate cave can be picked to suit the skill and experience of the people who will be caving. The risks from wet weather can be assessed. Sometimes we will be exploring new stuff. Either unknown passages in caves and mines, or entirely new caves. These can take years of effort digging out rubble and earth fill before open passage can be entered. Some of us go on expeditions abroad with the aim of finding and exploring new caves in an area that has potential for new systems. 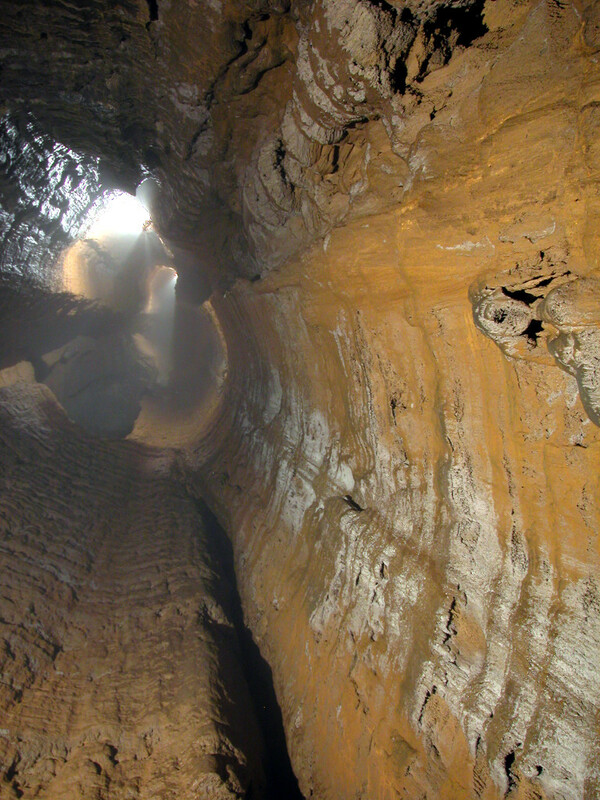 Looking straight up the 284m high main shaft of Da Keng cave near Tian Xing, Chongqing Municipality, China. 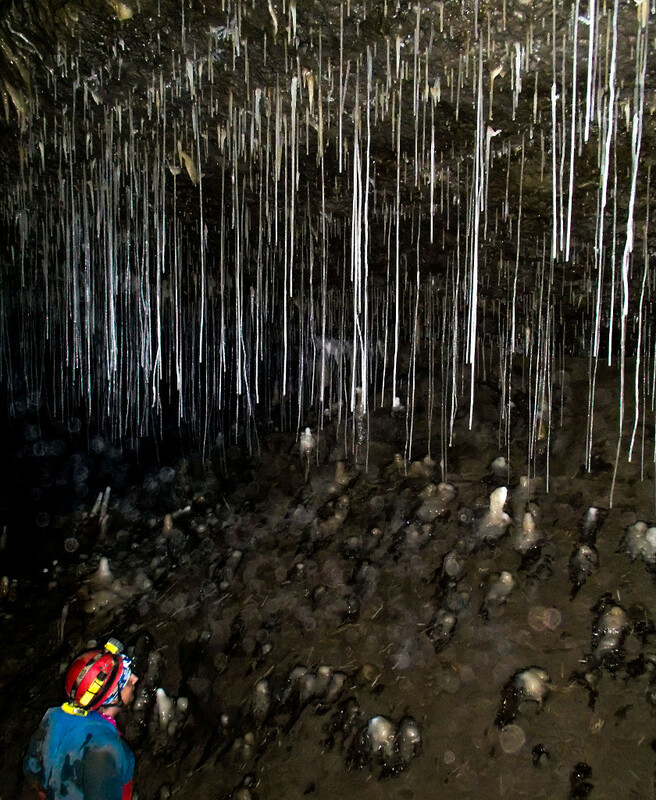 Two CCPC members were involved with the Hong Meigui Cave Exploration Society expedition that explored this cave. Flashbulbs were set off at 0m, 84m and 184m above the camera. Photograph © Jenny Drake, 2003. Cave passage that is completely filled with water will require diving techniques to pass if it is more than a few metres long. Cave diving is a specialised activity and requires suitable training. The risks are high due to the lack of an open air surface above the diver. Cave divers are usually competent cavers who train to acquire the extra skills to dive underground. Time spent underground on each trip can vary from a few hours to over a day, but a typical club trip will probably be four to eight hours long. We mostly travel to the cave for the day, sharing transport as required, then return home in the evening. For trips to caving regions further away we may go for a weekend, or longer, staying in huts owned by caving clubs, bunk houses, or even camping. Cave and mine passage can vary in difficulty from a simple walk, to scambling over boulders, to stopping, through to crawling. Passage sizes vary from barely big enough to crawl through, to some that are so large our lamps can't penetrate from one side to the other. Vertical and sloping drops, or ascents can be climbed if they are simple. We may use a rope for confidence and safety, or none if the drop is small and the difficulty low. For longer and more difficult drops we use a variety of means to get down and up. Thin flexible metal ladders were developed in the 1950's and are still sometimes used. A rope is used as a lifeline to protect the caver if they fall, or the ladder fails. This method of descending vertical drops is know as "Ladder & Lifeline". In the 1970's a system for descending and ascending a rope was developed using friction devices for going down and sliding rope clamps for going back up again. This is known as "Single Rope Technique", or SRT. SRT is the most common way we now cope with vertical sections, or pitches in caves. It allows us to descend very deep caves with a minimum of equipment to carry. It does however require us to learn the skills involved in safely rigging the rope and negotiating the drop. The rope itself is between 9 and 11mm thick and is very strong. Caving equipment needs to be very tough to survive being dragged over abrasive rock and mud. Over the years cavers and equipment manufacturers have developed a set of specialised gear that can cope with the demanding conditions. Even when looked after the life of caving equipment is still often nasty brutish and short! The cave environment is completely dark. The temperature is usually constant throughout the year and is the average temperature for the land above. This means they feel cool in summer and warm in winter. Caves are formed by flowing water and this will often be found underground. Immersion in water can rapidly cool the caver and their clothing must be able to cope with this. There can be strong draughts blowing, particularly near vertical pitches with underground waterfalls dropping down them. Lighting. Caves are dark! Once you are away from the entrance there is no light at all. Turn out your light and you cannot see your hand in front of your face. You need to take light with you and your lamp is the most important piece of equipment. We mount our lamps on a helmet to keep both hands free and remove the risk of it being dropped. Since the turn of the century there have been huge advances in LED lighting and these have almost completely replaced the lamps we used before. LED lights allow very bright beams to be produced that can be powered for many hours from small rechargable, or replacable cells and battery packs. This lighting method is still advancing at a considerable rate and new improved lamp systems are coming out all the time. The lamp needs to be reasonably waterproof. In addition to our main lamp we also carry a spare. This can also be mounted on the helmet, or carried elsewhere. With such an important piece of equipment, a backup is essential. Helmet. As well as being somewhere to hang your caving lamp, it also protects your head from hitting low roofs and from anything falling from above. Our helmets these days tend to be climbing ones with added lamp mounts. Boots. Wellingtons are by far the most common boots used for caving. They provide excellent grip on rock and mud underground and give good protection for shins. Leather boots dry out like concrete once they get wet and soon degrade and fall to bits. Clothing Underground clothing needs to keep you warm in the cool and often wet environment. It also needs to be resistant to the abrasive rock and mud. The most common outfit consists of a one piece fleece suit, often called an undersuit, or furry suit. The undersuit doesn't provide much insulation when the caver is immersed in water, but drains quickly and is warm again when you emerge. Over this is worn a one piece suit made of a hard wearing material that provides abrasion protection and varying degrees of water proofing. This is known as an oversuit. For very wet caves where the caver is immersed in cold water for long periods, neoprene wetsuits are still used. Knee and Elbow Pads When crawling, our knees can take a real pounding. We use a variety of types of knee pads to protect them. Some cavers use elbow pads too. SRT Kit If we will be encountering a vertical pitch, then we will probably be taking an SRT kit to descend and ascend it. A harness is used to suspend the caver from the rope. It looks similar to a climbing harness, but is specfically designed for caving. To descend we abseil down the rope using a friction descender. A number of different types are used, but the most common is the Stop, made by Petzl. To ascend we use a minimum of two sliding rope clamps, called ascenders, or jammers. These slide up the rope, but lock on to it when weight is applied. By having one jammer attached to a set of foot loops and the other attached to the harness, we can alternate between each jammer, steadily raising ourselves up the rope. A pair of rope safety cords, with karabiners (krabs) attached, allow us to clip in at the tops of pitches for safety. These are known as cows tails. Full training in the use of SRT kit can be given by the club. In addition we will be taking spare food, drink, batteries and clothing for ourselves as well as rope, karabiners, and other rigging gear. These will be carried in stout bags, called tackle sacks. After reading all this perhaps you are wondering what we get out of all this. If so, then have a read of Why We Do It. Straw formations in Shuttleworth Pot.